How to apply survey weights in structural equation modeling (SEM) with lavaan. 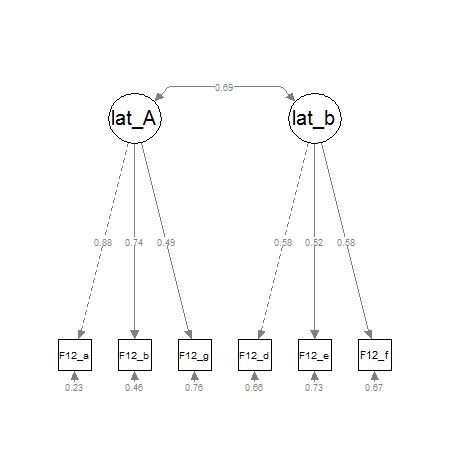 The R-Package lavaan is my favourite tool for fitting structural equation models (SEM). Its biggest advantages: It´s free, it´s open source and its range of functions is growing steadily. Before lavaan, i used MPLUS, which still has the widest functionality of all SEM-Tools and is the most sophisticated software for latent variable modeling. The Muthéns and their MPLUS-team offer incredibly good support and documentation. The only problem is, that the software isn´t free and without a license you can´t get any of the support. For me, one drawback of lavaan is, that it can´t model latent class models or mixture models …yet! Yves Rosseel is planning to add this in the next two years. lavaan stands for „latent variable analysis“. The package is available via CRAN and has a good tutorial on the lavaan project homepage. Models are specified via syntax. Thankfully, the lavaan-syntax is kept pretty simple. At least, it´s a lot easier than the LISREL-syntax (the first, and original SEM-software). 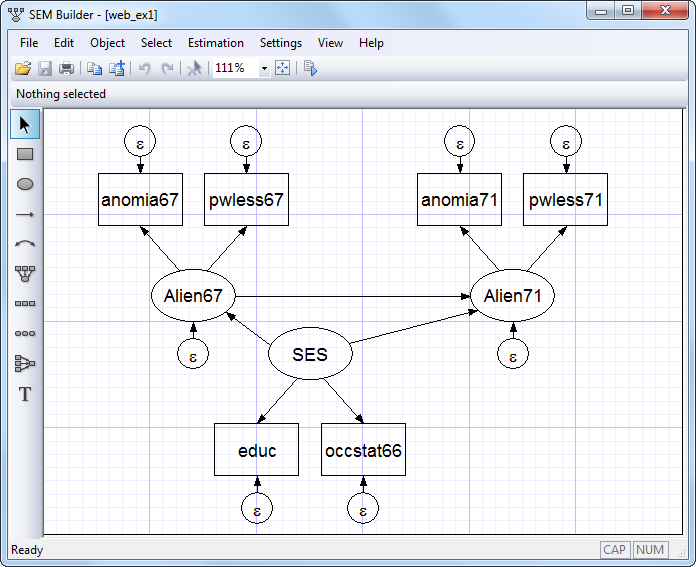 But it´s not as easy as drawing a path-model in AMOS, the SPSS-module. Anyway, once you get to a little more complex models, you´ll find working with syntax a lot more efficient. If you don´t like working with syntax, i recommend having a look at Onyx – a graphical interface for structural equation modeling by Andreas Brandmaier. It´s a free tool in which you can draw your SEM as a path diagram and generate the lavaan-syntax from it. But, when you do SEM-models the syntax will be the least complicated thing you had to learn, so i don´t think that will be a problem at all. If you want to use survey weights, you have to install lavaan, the survey package and lavaan.survey. Lavaan is the package used for modeling and the survey-package converts your data into an survey-design-object. After you specified the model in a lavaan fit object and you have generated a survey-design-object from your data, these two objects are passed to the lavaan.survey function, which will calculate the weighted model. After the packages and the data are loaded, a svydesign-object is generated from our data. It´s not a suprise, that with „id=~ID“ the column „ID“ in the dataframe will be used as id-variable. 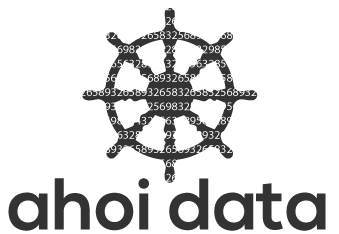 With „weights= ~weights_trunc“ the column which holds the survey-weights is defined and with „data=data“ the dataframe is chosen. I´ll use a simple structural equation model with two latent variables, measured by three and two indicator-variables. The exogenous latent variable „latent_a“ is measured by x1-x3, the endogenous latent variable „latent_b“ is measured by y1-y2. The variable „latent_b“ is regressed on (predicted by) „latent_a“. Normally, i would use MLM as estimator to get robust estimates (robust against non-normality of the endogenous variable), but in this case i chose MLR, because FIML is not available with MLM. FIML (Full Information Maximum Likelihood algorithm- defined with missing=“ml“) is regarded as equally efficiant to multiple imputation in handling item-nonresponse. But, it can be a good idea to do multiple imputation anyway, because bootstrapping the standard errors is only available with ML-estimator. On the other Hand, it´s an advantage that with FIML it´s not necessary to explicitly model missingess, because FIML uses the already specified SEM. When using the lavaan.survey-package, you can´t use fiml (yet). You have to do a multiple imputation for your data, if you have missings, and instead of MLR lavan.survey uses MLM as default. When the model is fitted with lavaan.survey, the covariance-matrix will be estimated using the svyvar-object generated by the survey-package . The lavaan model uses this weighted covariance-matrix with the MLM-estimator to fit the model. MLM is not compatible with missing=“fiml“, so if your data has missings you have to do multiple imputation first and pass your imputed dataframes as a list to the svydesign-package so it becomes a svy.design-object which can be used as data in lavaan.survey. The resulting parameters, fit indices and statistics will be adjusted for the sampling design. Also, if MLM is used, the chi-square (likelihood-ratio) test-statistic will be transformed to a Satorra-Bentler corrected chi-square. [This information stems from the lavaan.survey documentation]. In lavaan, you can choose the form of your output. Because i worked a lot with MPLUS, i prefer the MPLUS-Output. I wouldn´t have expected that using weights in a SEM-analysis with lavaan is so easy to accomplish. Here are the fit-indices of the weighted SEM. …and so on. I don´t show the whole results. It´s common to show the parameter-estimates in a path-diagram. In my next blogging-session i´ll demonstrate how to draw path diagrams of a lavaan-model with SEMPLOT (Project Homepage).